Read Marisa's review of Mission of Honor. 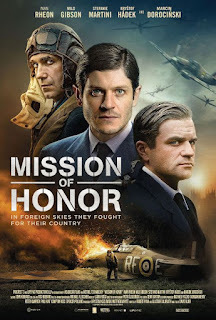 The story follows Jan Zumbach (Iwan Rheon) and the brave pilots of Squadron 303, a group of fighter pilots enlisted by British Royal Airforce after a war-torn Europe has been ransacked by German Nazis. John Kent ‘Kentowski’ (Milo Gibson) has his work cut out for him when he’s handed the angry, defeated, and often maligned squadron to command. Mission of Honor is in select theaters on March 15th, 2019. Mission of Honor flies under the radar in terms of WWII films from director David Blair and the Cinedigm studio. The film follows a squadron of Polish pilots fighting under the Royal Air Force after Poland was quickly felled between German and Russian forces. As Great Britain grows more desperate for pilots to hold back the Nazis, the Polish pilots are even more desperate to do all they can just for the idea of an independent Poland to stand on its own again. The British and Polish struggle to work together at first with all the racial tension, but equipped with the Hurricane airplane and a lot of courage they were fight together and save the future of their countries. Starring Iwan Rheon (Jan Zumbach 'Donald'), Milo Gibson (John Kent 'Kentowski'), and Stefanie Martini (Phyllis Lambert), the film is currently available in select theaters and streaming services. I was surprised that I hadn't heard of this film before, as I always keep an eye out for any type of WWII film, but instantly recognized the two first names of the cast and dug a bit deeper. Having Game of Thrones alum Rheon and Mel Gibson's son is an instant grab for anyone who stumbles past this film, but let me assure you, their performances absolutely exceed their names. Rheon is a superb lead as a Polish pilot, even with a large percentage of his dialogue in Polish. This is a bit niche in its genre, but it is an important story that is told well considering the $10 million budget. The film suffers from some shaky camera work at times and rough CGI of the dogfights, but overall it holds attention and does get the job done. I lost some interest in the side-plot of the women working with the RAF behind the curtain, but Martini makes it work with her chemistry with Rheon. I admit that I was skeptical of the casting just based on getting the recognizable names in there, but it is both convincing and watchable as a whole. Following Christopher Nolan's Dunkirk, these smaller stories amidst war are given a chance to be told and David Blair navigates well with a significantly lower budget. As long as the audience does not have 2018 film quality expectations, all the goosebumps that come with adversity and triumph can be celebrated in Mission of Honor.